Curly yellow flower buds spread across the yard on woven bamboo sheets. 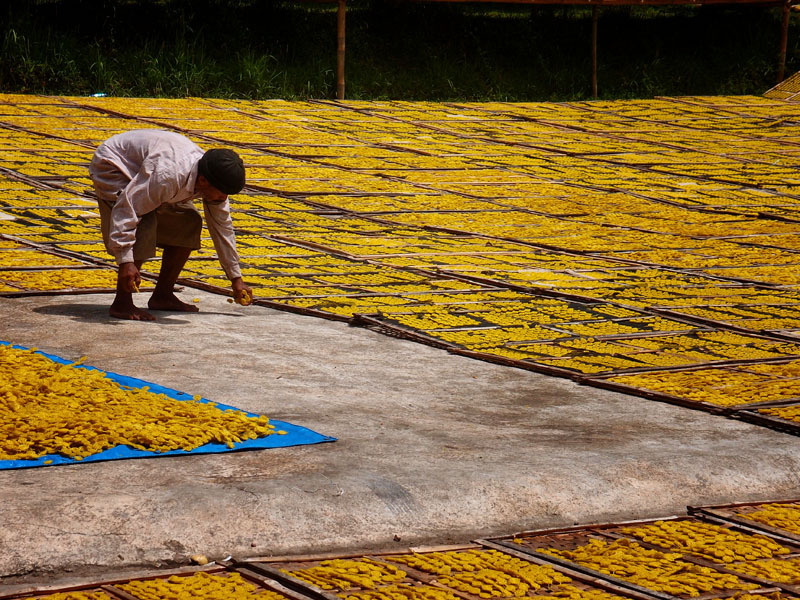 These are not flowers, but the makings of krupuk, the popular crunchy Indonesian snack. Krupuk comes in many forms, and these particular ones are made from fish, tapioca flour and turmeric, giving them their bright yellow colour. 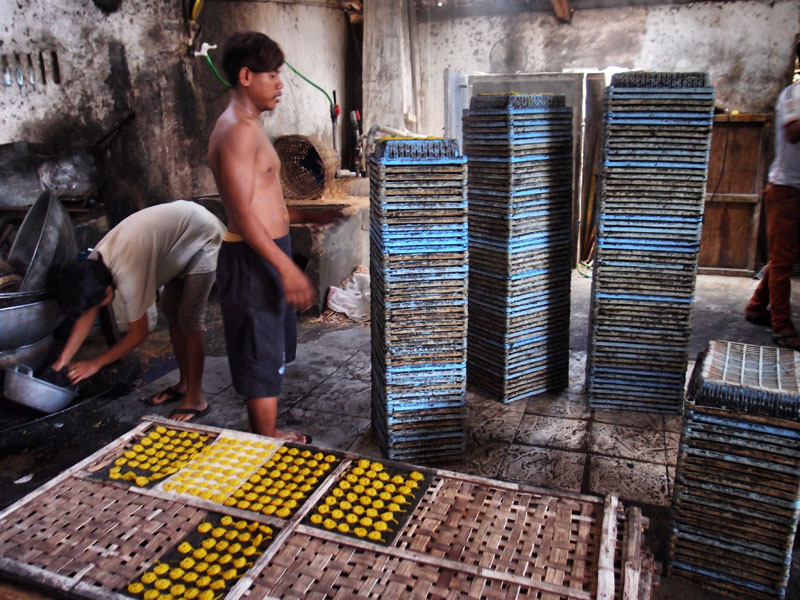 We are visiting a small home industry near Pangandaran, West Java, Indonesia. Krupuk or ‘prawn chips’ or ‘crackers’ as is often the translation (sometimes misspelled ‘creakers’) is the generic onomatopoeic name for a variety of crispy type snack foods in Indonesia. They can be made of various types of flour, but usually tapioca or rice flour, and are sometimes flavoured with fish or prawns and spices. There is even one kind that is flavoured with sulphur. Some are also made from fruit, or animal skin. They are ubiquitous, and often accompany many local dishes. 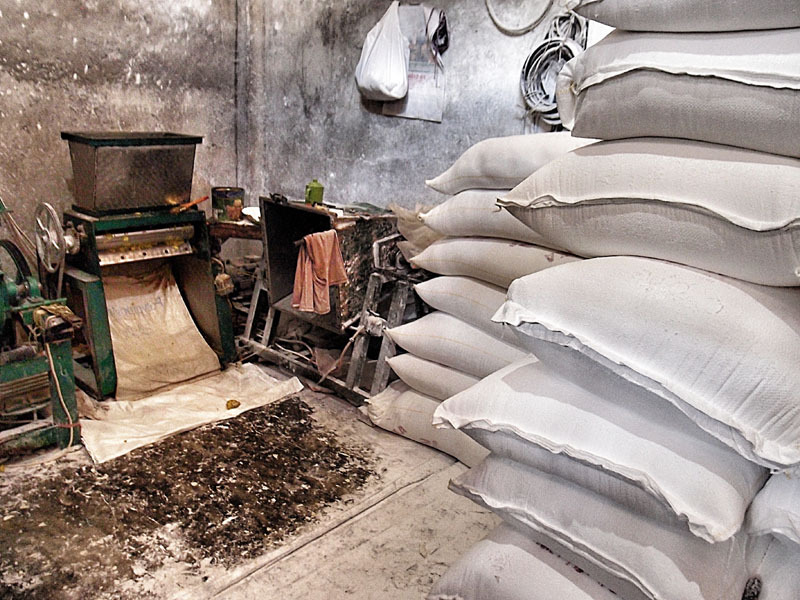 Sacks of tapioca flour wait to be turned into krupuk. Pangandaran, West Java. The “3D Spirograph” krupuk machine. Pangandaran, West Java. This small family business produces thousands of krupuk per day, and we have arrived on a day when the sun is shining, perfect for drying the dough, hence, the carpeted front yard. The small factory is busy when we enter. In one corner a large mixer is kneading the tapioca flour, fish paste and spices into a thick dough. The nearby walls and floor are covered in flour. Bags of the fine white powder sit stacked neatly against the wall, as though they too are waiting their turn. A large green machine clunks and whirls, as a young man climbs to fill the chute with dough, underneath another man is fitting mesh sheets into the base that will receive the curly noodles of paste. The machine begins the spew out the small, even, curly circular discs of spaghetti like strands. It’s a 3D spirograph. He picks one out of every batch, and discards it. I ask is it to let air in when they steam it? He replies, no, one of the spigots is damaged, and that krupuk is not up to standard. Quality control. Laying steamed krupuk out to dry. Pangandaran, West Java. 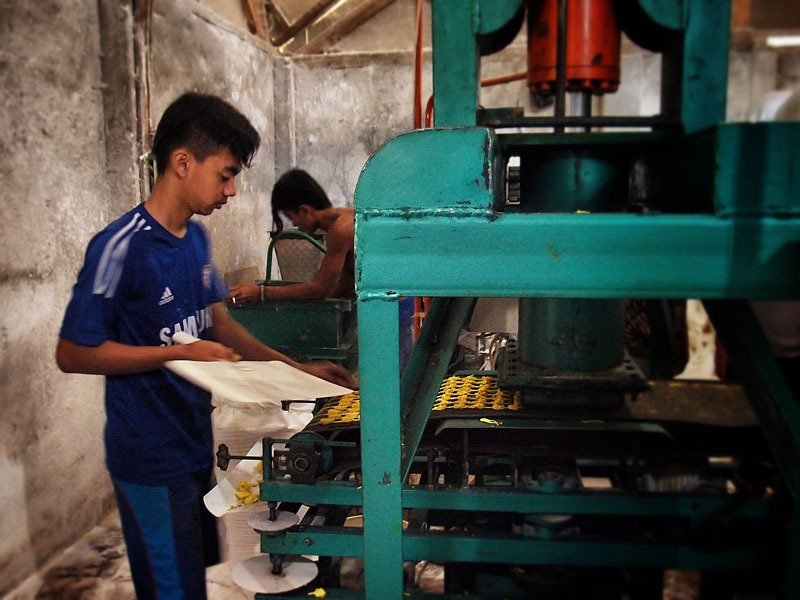 Krupuk factory. Pangandaran, West Java. The mesh sheets are then transferred to colander like boxes, stacked and placed in the large hissing metal steamer where they are cooked until they resemble translucent plastic. If the day is sunny, like this day, they are moved into the yard to dry. After a few hours they become quite brittle and hard, and even more plastic-like in their appearance. At this stage they could be stored for several weeks, or sold for people to do the final cooking at home, however these ones are destined to be cooked here, and sold ready to eat. Once thoroughly dry, the yellow plasticy discs are lowered into one of the industrial size woks filled with hot coconut oil. The fuel is discarded rice husks, everything has a use. Within seconds they hiss and expand and rise to the surface like fluffy phoenixs, then are scooped out to drain and cool. 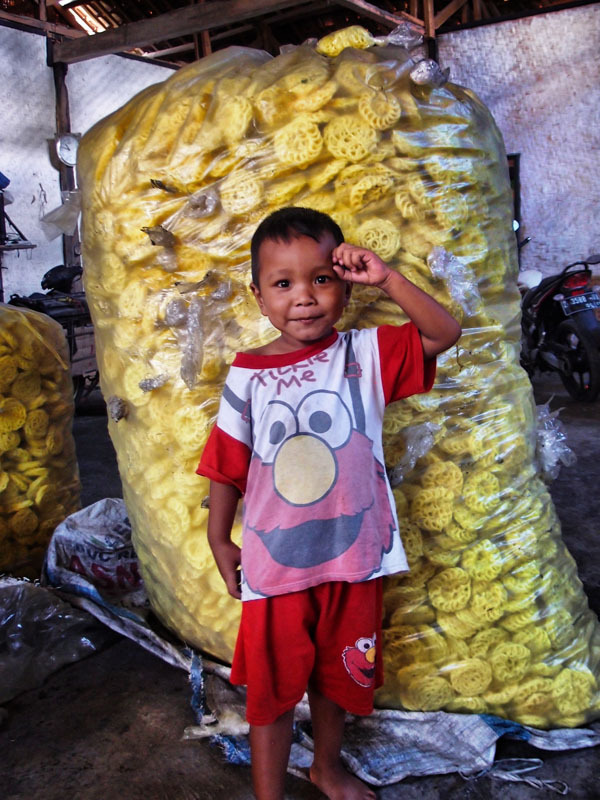 Young boy helps with a big bag of krupuk. Pangandaran, West Java. In an adjoining room two headscarfed women sit on the cool cement floor packing the krupuk into plastic bags, and tying the tops with string, ready for sale. They hand us a sample to pass around. Fresh light and crispy, slightly salty, slightly sweet, hardy fishy at all, and very very moreish. It’s hard to stop at one.